From April 30th to May 1st, Global Advantage attended the OCE Discovery conference held at the Metro Convention Centre in Toronto. 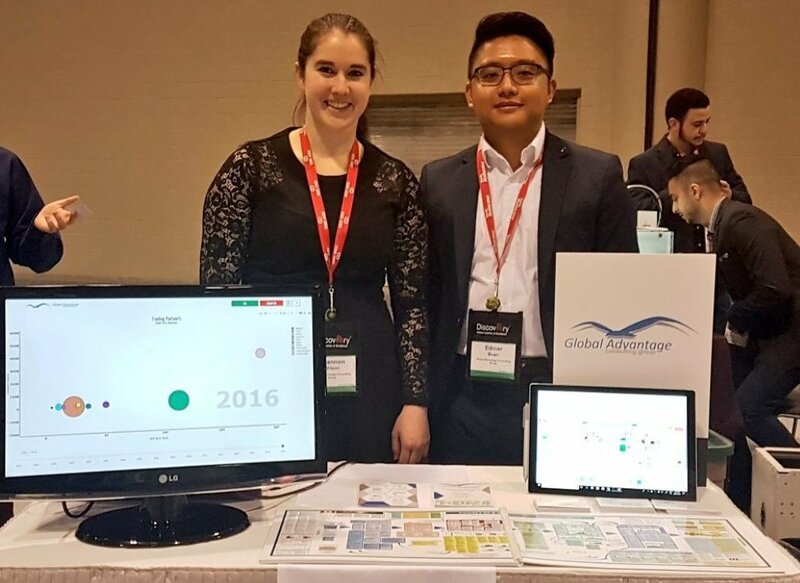 Shannon and Edmer were invited by Algonquin College to showcase our ecosystem maps and data visualization tool, Dancing Data. Dancing Data has been developed in partnership with Algonquin’s Data Analytics Centre, and we are continuing to work with the college in pursuing further technology development. The Ontario Centre of Excellence Discovery is held every year in the Toronto Core with over 3800 attendees Discovery and is known as Canada’s leading innovation-to-commercialization conference. There were many notable exhibitors and keynote panels throughout the conference, including discussions on Artificial Intelligence, Smart Cities, Next Generation Manufacturing and Climate Change. Our team was also able to meet Sophia, the most advanced Humanoid Robot in the world. After attending and learning so much about Canada’s rising AI community it has inspired our team to look further into working with AI and integrate it into our digital map and dancing data tool in the foreseeable future. Overall, OCE Discovery was an extremely informative and innovative event and our team couldn’t be more delighted to have attended.